Elderly dementia care can be a full time job. If you are also responsible for a family of your own, the stresses can become overwhelming. You are only able to be in one place at a time — although your family may think differently. One way to reduce some of the burden that comes with caring for a loved one is to plan ahead for emergency situations. Knowing you are prepared for various scenarios will help you sleep better at night. 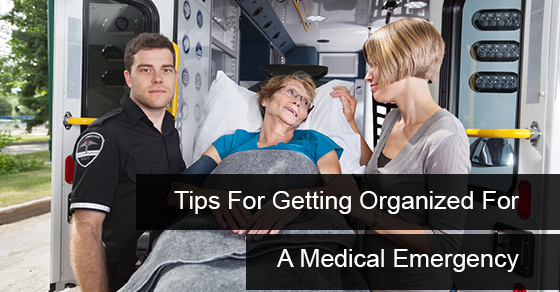 Let’s look at several tips for getting organized for a medical emergency, especially with a senior. Of course, anything can happen but depending on the senior, some problems are more likely to occur than others. Is your senior still living at home? Do they live with you? Do they have ambulatory issues, are they hearing impaired, diabetic, or have heart disease? Consider everything, then determine which emergency situations are most likely to happen. Focus on those. Make your home or theirs ‘senior friendly’ and safe. Bathrooms should have guard rails. Remove rugs and any obstructions that could lead to a fall. Maybe ramps are necessary if they take walks, or chair lifts if they must climb stairs. Be proactive and prevent what you can control. Think of every single thing you would need if any situation arose. Classes are available in your community so caregivers can learn what to do when certain emergencies arise. Taking appropriate action quickly can be the difference between life and death. Whether it’s broken bones after a fall, a heart attack, or a possible stroke, time is critical and knowing what to do can save a life or prevent a long term rehabilitation. Include your family in whatever plans you make. Everyone can have a part. Even if you have elderly dementia care from professionals like C-Care Health Services, everyone needs to be on the same page. Actually practice and have an emergency drill with your family so it will become clear what everyone’s role will be. Order a medical alert bracelet if appropriate. Consider a medical alert system for your senior. Being prepared for any medical emergency assures that your loved one will get the timely first aid and medical attention they require. contact the professionals at C-Care Health Services.